It’s been some five years since the last entry into the Underworld franchise – Underworld: Awakening, the third sequel to the 2003 original – no doubt because that film almost, ALMOST killed the series…. However as the saying goes, time heals and in the case of these movies that seems to be true. Not only has it been long enough for audiences to forget the risible fourth film, but the break in production also seems to have revitalised the filmmakers too – and this time round we have a film that truly lives up to the “vampires vs. werewolves” premise proffered so many years ago. Vampire death dealer, Selene (Beckinsale) is on the run with her only ally David (James). The pair spend their time fending off off brutal attacks from both the lycan clan that want Selene’s daughter and the vampire faction that betrayed her. With new lycan leader Marius (Menzies) laying waste to vampires everywhere, newly appointed member of the vampire council Semira (Pulver) calls for Selene to be pardoned and brought back into the fold to train a new army of death dealers. Well those are the basics… There are still plenty of twists, turns and reveals along the way that will satisfy long term fans of the franchise – for everyone else, thank god for that recap! One of two horror films out this week directed by women, Underworld: Blood Wars is also the feature-film debut of Anna Foerster, who previously worked in TV, helming shows such as Outlander and Criminal Minds. I mention this because this latest film is a breath of fresh air for the series – especially in terms of characterisation and overall look. Now whether it is because we’re getting a female perspective on the franchise or whether it’s because, for the first time, Len Wiseman was not involved in this particular film’s script or story is up for debate (I suspect the former). 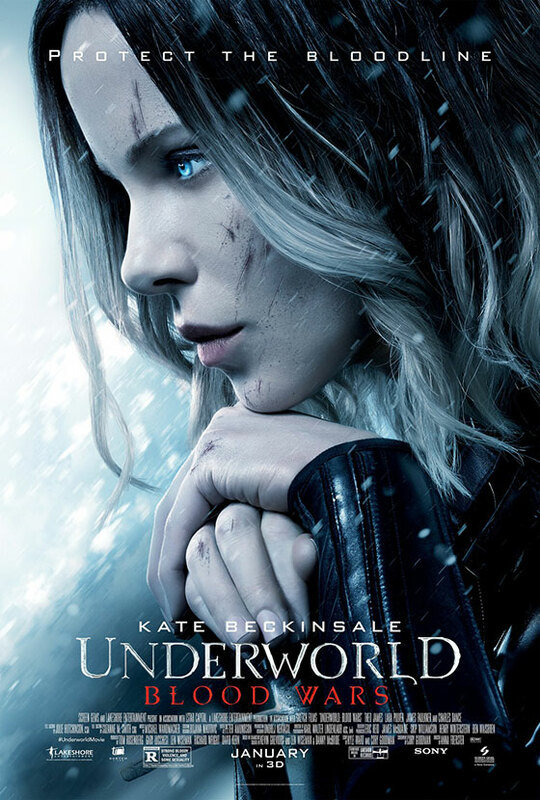 For not only does Underworld: Blood Wars have an old-school gothic-horror look and feel – the large castles, eerie atmosphere etc, that echo the likes of Hammer’s classic Dracula movies – but Selene herself has more depth this time around: there’s a turmoil within her that drives her, yet is also her weakness. Of course this film still suffers from dodgy CGI, with some “interesting” transformation scenes of this films gang of lycans (can ANY film really produce decent-looking CG werewolves?) and the usual excessive amounts of digitally-enhanced blood splatter – but by now everyone knows those are a trope of this series, plus without the CG we wouldn’t have the epic werewolves vs. vampires battle, complete with some superb scenes of vampires crumbling to dust - just one of the fantastic action highlights of this movie. Besides, everything here is light years beyond the terrible CG-filled finale of the previous movie! Underworld: Blood Wars also brings some great additions to the franchises mythos with it too: the Nordic vampire clan, living in a castle in the snow, discovering that death is not the end; David finally discovering his personal truth; and just how important Selene, Michael and David truly are to the future of the vampire clan… For those interested, the Eve story is still here, though she is used more as a driving plot point rather than the centre of this film’s story and Blood Wars is all the better for it. Whilst this does continue the overarching Underworld story, Underworld: Blood Wars also feels like something of a reboot for the series, especially come the conclusion; and it will be interesting to see where they can take a sixth film given the new status quo. Underworld: Blood Wars is in cinemas now. “Selene herself has more depth this time around: there’s a turmoil within her that drives her, yet is also her weakness.” Well said! Blood Wars is also the most poetic and philosophical instalment of the franchise. “There is no beginning. There is no end. There is only the coming…” Selene’s monologue at the end is beautiful. These lines are simply amazing. PS: You should give Awakening more credit. It is my second favorite of the franchise. That movie was beautifully shot and the most action-packed.